100% natural ingredients - go on, check out what I'm made from! No added sugar - only natural sweetness. Gluten Free. Dairy Free. 1 of your 5 a day. Vegan. Kosher - KLBD. 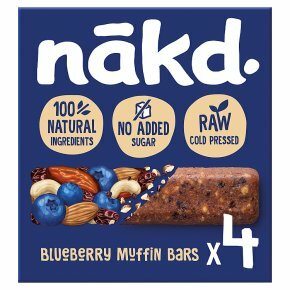 Muffin compares to Nakd Blueberry Muffin, the snack bar bursting with scrumptious flavours. Just fruit and nuts smooshed together, this blueberry beauty is free from gluten and dairy and made from 100% natural ingredients. All of that and it counts as one of your five a day! Much tastier than your average cereal bar eh?